Hey! New thing for Define Functioning! A Bulletin Board! As many of you know, I’m neurotically opposed to blindly endorsing or suggesting anything. (This is why I read everything I put in the Reading Room.) That’s precisely why I’m calling this a “bulletin board.” In these posts, I’ll send out an announcement for events and the like that may spur some discussion here for us, but that have not been thoroughly vetted by me (which is basically impossible because the events haven’t happened yet). If you have something to post on the Bulletin Board, shoot me an email at definefunctioning [at] gmail [dot] com. 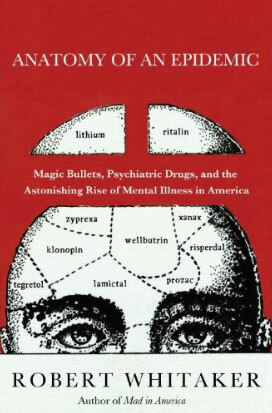 Yesterday I received an email about an event in Portland, Oregon, called “Rethinking Psychiatry/Moving Mental Health Recovery Forward: A Community Forum.” I was sent the email because I am currently reading Robert Whitaker’s Anatomy of an Epidemic: Magic Bullets, Psychiatric Drugs, and the Astonishing Rise of Mental Illness in America. Whitaker, along with five others, comprise a panel “who will share their perspectives and plans to create a more compassionate mental health system in Oregon and across the nation” (emphasis in original, quoted from the event website). The event is Thursday, 10 February 2011. If you live in or around the Portland area, you can find all the details you need here. If you do not live in or around the Portland area, I’ve been promised video of the event in a couple weeks. I’ll post a link so we can see what they said…and talk about it if we want to. As for the Reading Response to Whitaker’s book. If you’re reading along with me, you know that this is a challenging work in more than one way. I’m going to break my habit of writing as I read in order to see where this is going. The story he is telling is, thus far, linear — suggesting it would be imprudent for me to comment until I know how or where it ends. I’m a little more than 100 pages (of a 300+ page book) into it and need to see what conclusions are drawn before I know what to think. If you’re not reading along with me, I can so far tell you that it’s worth a read…at the very least as food for thought. However (Fair Warning), if you’ve been told the things I’ve been told about the causes for your mental illness, the first hundred pages are difficult. I mean, the kind of difficult that you’ll need to discuss with your psychiatrist.